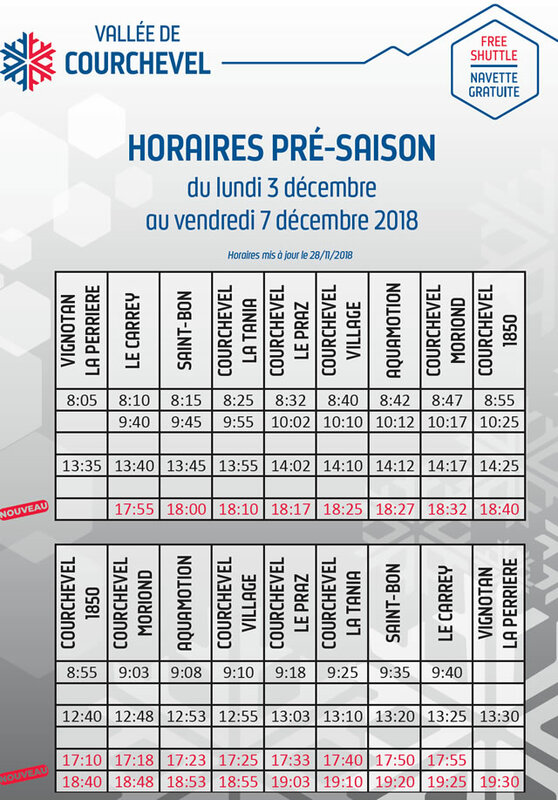 The new “pre-season” bus service was announced last week and now the rest of the season service has been revealed which for opening week includes La Tania for the first time ever. This is something we’ve requested for years when 1850 lifts open and there’s no lifts or bus service from La Tania. There’s an increase in the service in main season too for La Tania although the main season timetable is still PROVISIONAL at this time. There’s an early bus departing La Tania at 08:30 to arrive in Courchevel 1850 for 09:00 then it is simply a 10 minutes past the hour service every hour from 09:10 to 01:10. No gaps in the evening service now and a later bus back to Courchevel by an extra hour. Similarly the last bus back from 1850 is now 00:40 with a service to Le Praz departing 1850 at 01:40 arriving 02:03.